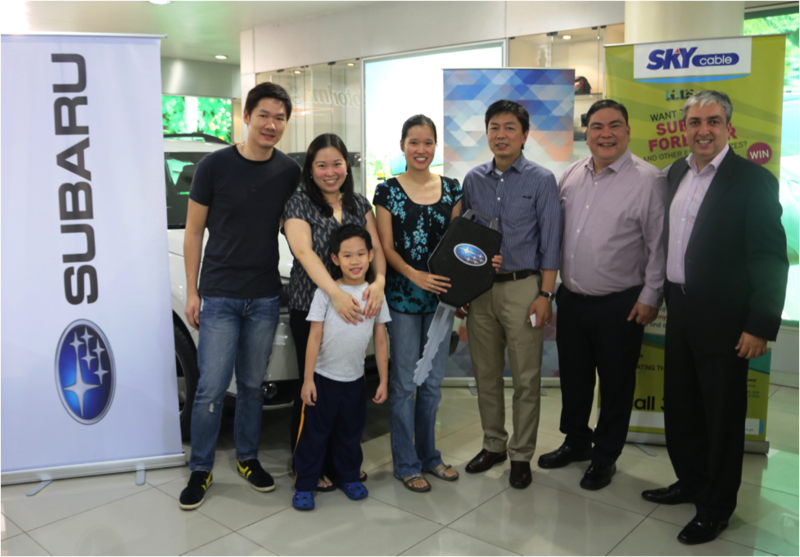 A lucky SKYcable subscriber won a brand new Subaru Forester after the grand draw of the “HITS A SUBARU!” Raffle Promo sponsored by HITS, popularly known as the channel that celebrates the best TV all in one place! Darlene Tan, 33, a manager in their family business, was the grand prize winner. Darlene and her family has been a SKYcable subscriber since 1992 and is an avid fan of HITS which features TV’s all-time favorites and critically-acclaimed series. She watches marathons of Law and Order, The Golden Girls and her favorite series, The X-Files. It was through the channel’s promo commercials that she found out about the raffle and decided to join just for fun. Last September 17, 2015, Darlene, together with her family, excitedly claimed her grand prize which was officially presented to her by James Dumlao, SKY Cable Head of Programming, Bob Palanca, Motor Image Pilipinas (Subaru) Deputy General Manager, and Avi Himatsinghani, HITS Founder and CEO. Aside from the grand prize winner, 9 other lucky subscribers were treated to various cool prizes during the monthly draws. Every month since the promo was launched in May, the lucky winners got to take home a Fujifilm Instax Mini 8, a Samsung 40” LED TV, and an iPhone 6. Cheers to all “HITS A SUBARU!” promo winners! To view the complete list of winners, visit SKYcable’s website at www.mysky.com.ph/HitsASubaru.